I cannot express how much I love my monthly subscription box, Love with Food. 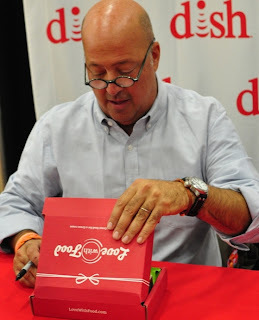 I was super excited to hear that Love with Food was featured by one of my favorite celebrity chef's Andrew Zimmern. I have never been disappointed with anything I have received in my previous boxes plus it feels good to give back to the community. I have been introduced to new foods and I have a lot of fun making Gabe's lunches with the different snacks we receive. This month's box was the Holiday themed Love with Food box!! The first thing that caught my eye in this box was the Fleur de Sel Caramel Popcorn from 479 Popcorn. That's right....salted caramel popcorn. I could eat bags and bags of this stuff. It was so delicious. Next up was the Belgian Milk Chocolate dipped nutter butter from the big chocolate dipper. I literally hid this from Gabe. This one time, I hope he doesn't read my blog on a daily basis because I don't want to hurt his feelings. The Honey Cinnamon Almonds from Nunes Farm were excellent. I used them in a spinach, egg and chicken salad for dinner the other night. The have the perfect amount of sweet and spice for salads. I loved that this box had an assortment of different holiday candies. Both the Candy Cane Truffles by Kara Chocolates and the Chocolate Tasting Squares from Madecasse lasted all about 5 seconds after opening the box. I swear, Gabe is like a puppy when I open my subscription boxes. The Holiday salt water taffy from Taffy Town was a shocker. I didn't read the description, so when I thought I was eating a banana flavored taffy, it was actually eggnog. Delicious but was not expecting that. The other flavors I received were cinnamon rolls and spearmint snowman. Finally, a Gingerbread boy with white chocolate from Nikki's cookies, which Gabe had in his lunch today along with Mocha Mint Cappuccino from Hills Brothers. Love love love! Another successful box from Love with Food. For November and December, Love with Food donated two boxes of food for Hurricane Sandy survivors for every subscription box sent out. You can sign up for January's box by clicking here. Also, Andrew Zimmern has a coupon code for $5 off by using AZVIP at checkout. Ok, thanks for the code...I finally took the plunge and signed up...since I live in the Caribbean...Im sending it to my parents and letting my dad have all the fun opening them - he'll love it. Thanks! I love this box, too... and I forgot how much I loved gingerbread cookies until I had this one. It had been so long... and I think this was the best GB cookie I ever had!